Tattoo artist Darryl Wiebe of Way Cool Tattoos works on some designs in downtown Kitchener on Sept. 19. They say that we leave a permanent impression on everyone we meet but for Darryl Wiebe, that’s his job. He’s 21 years old and he’s already got his career figured out. Wiebe is a tattoo artist. While at Waterloo Oxford High School, Wiebe always had a knack for visual art and spent a lot of time drawing on things such as notebooks and binders but he especially liked to draw on his friends. 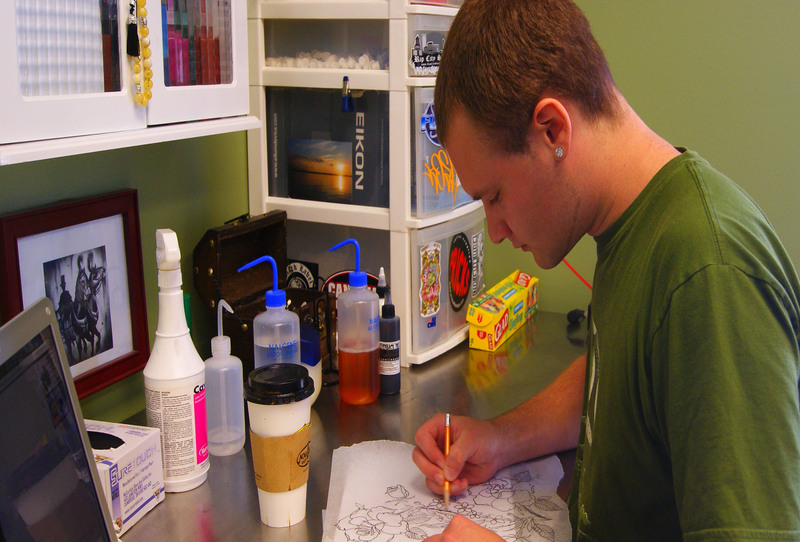 Although he could see himself going into firefighting, screen printing or advertising design, it was no surprise when his art teacher suggested an apprenticeship at a tattoo parlour. So he made a portfolio, went down to Way Cool Tattoos and “bugged them” until they gave him his apprenticeship. It’s nice to know that the first thing they stress in training is sterilization. Wiebe’s advice when picking a tattoo parlour is to make sure you ask about how they keep their record for spore tests and sterilizations. If they’re willing to show you the records then that’s a good sign. If they staunchly refuse then they’ve probably got something to hide and you shouldn’t place your trust in them. Way Cool is ready and willing to show their records but one can feel reassured merely by the smell of the place as soon as you step in; it practically smells like a hospital. Beyond sanitation, Wiebe also had to learn how to use a tattoo gun. This began with practising on the smooth surface of a honeydew melon. Gradually, he progressed to giving tattoos to his friends and family that, as he put it, wouldn’t hate him if he made a mistake. At the same time he had to learn how to work on drawings in composition with the body. This way he can tell what images would translate well into tattoos.